Constructed from the zCover's high- quality silicone, zCover typeOn keyboard protectors mold perfectly to your MacBook keyboard and keep the keyboard clean and smudge free. Being extraordinary durable and a perfect fit, they protect your MacBook keyboard without restricting normal typing and maintaining a clear view of the keyboard. zCover typeOn keyboard protectors are removed just as easily and can be washed for easy cleaning. zCover typeOn Keyboard Skin designed for Apple MacBook® . 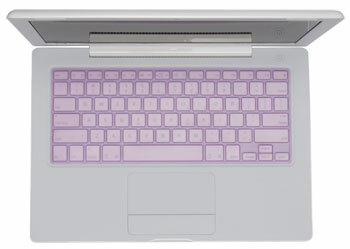 zCover typeOn Keyboard Skin for Apple MacBook® retails for USD$24.99. zCover is a pioneer and trend-setter in the fashionable silicone products market. zCover® iSA silicone cases have been nominated by Macworld Awards 2007 as editor's choice in iPod Accessory Category. zCover products are available at Apple retail store in Europe, Best Buy Canada, J&R and other electronic stores. ZCover is presently seeking partnerships with resellers to distribute zCover products worldwide.